Did you recently attend a Norwex party and fall in love with the product? Norwex is a radically different way to clean your home. It is so quick and simple, it can reduce your cleaning time by up to 75%. Norwex is completely non-toxic, environmentally-friendly and all-natural. It is safe for the environment and for your family. In fact, most of Norwex cleaning only requires WATER and an EnviroCloth. Using Norwex products will reduce what you spend on cleaning products by up to 50%. It is an investment, but over time you will find you save money because you are using water instead of a variety of cleaners. Norwex is the best way to clean your home! Want to Stock your Home with Norwex Products? The best way to start your Norwex collection, or to refresh the products in your home, is to Host a Norwex Party. THIS MONTH IS MOP MONTH!!! 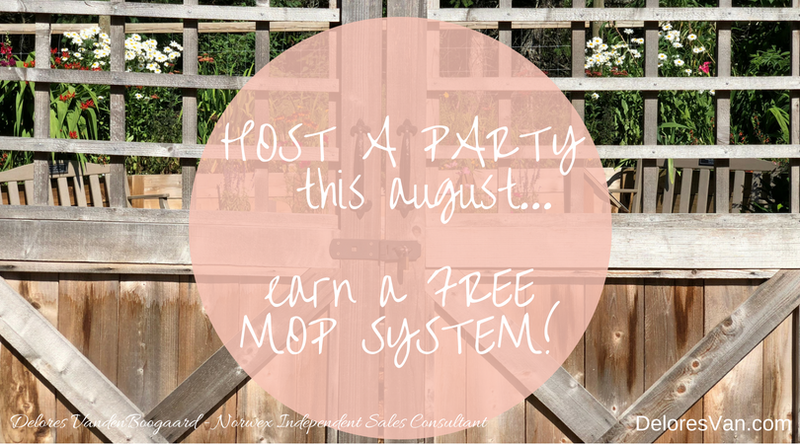 That is right, as a Host, you have the opportunity to earn not just one but two FREE NORWEX MOP SYSTEMS (including all the 2018 new mop colours. If you have any hard floors in your home… you will LOVE this mop system! Norwex has the most generous Host Reward Program I have ever seen. 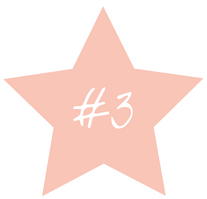 It is based on 3 criteria: Amount of guest sales, # of buying guests, # of new bookings. An average party sells $500 in products, so as you read through the rewards, remember that number! This month, Norwex is even more generous. They have added more rewards if your party reaches $1200 in sales. That means more free product for my hosts! I love describing Norwex’s Host Rewards as a 4-STAR Rewards… because it is that good and there are 4 ways to earn FREE product when you host a party in August. I always encourage my hosts to invite EVERYONE they know. Not just local friends and family, but from across the country. Norwex ships directly to your home. Plus, each order helps my host earn more rewards. Don’t worry if only a few people are available, I come for a crowd of 20 but I also love the smaller gatherings too. The Host FREE Dollars allows you to pick a few items from your ‘Norwex Wish List’ and get it for FREE. You will receive a percentage of the total guest sales (8%, 10%, 12% and 14% of $1200 for AUGUST ) starting from the first sale, to pick what you would like. Not sure what to pick? 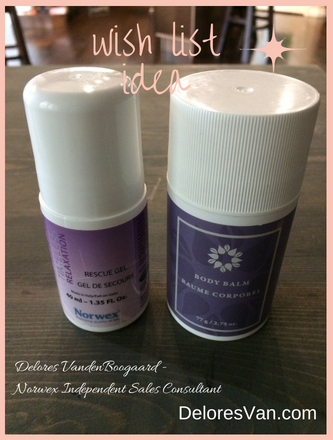 Let me suggest a few personal products to add to your wish list: The NEW Body Balm and the Timeless Rescue Gel. I use both of these all-natural, beautiful products as part of my daily regime. The Body Balm keeps my feet healthy and soft, while the Rescue Gel is excellent for bug bite relief as well as helps keep the summer-road-trip driver refreshed on long stretches by relieving tension and stress in the shoulders. Summer just got better! This reward starts with giving my Host receive FREE Shipping and then it gets better. Each sale level earns you more and more product. 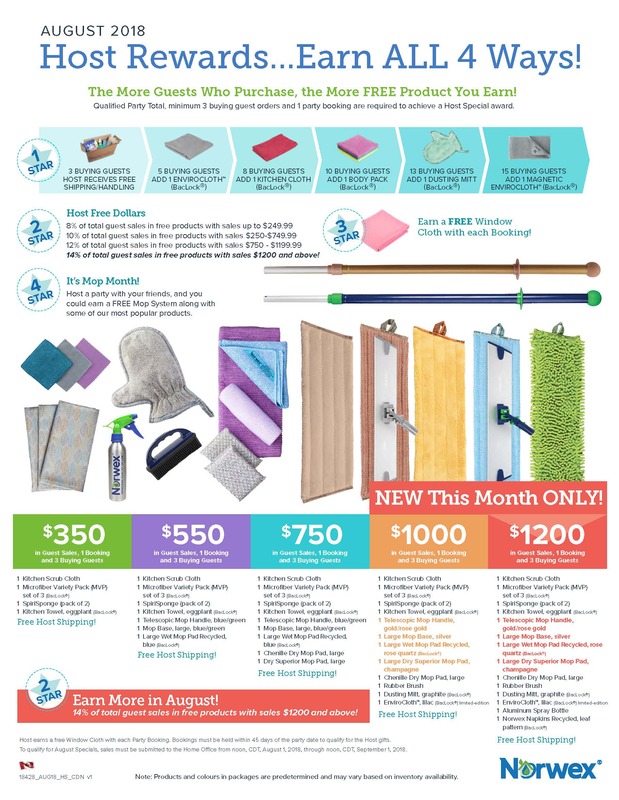 The $550 Sales level earns you a FREE Mop System! Let’s Talk about the Mop! No chemical cleaner required. Only needs WATER. Has the ability to remove up to 99% of bacteria from your floor surface when following the proper care and use instructions. Leaves your floor streak-free and shiny. The mop base has velcro that makes switching mop heads quick and easy. Mop Handle is telescopic and can be adjusted to fit anyone. The Microfiber Wet Mop Pad is made of 70% recycled materials. It is durable and helps our environment. No pail required. Simply rinse the mop head with hot water, wring it out, attach it to the mop base and get started. Helps maintain hard word floors quick and easy by using a figure 8 pattern to clean the whole floor. The Dry Mop Pad uses static electricity to attract and hold on to all the dirt, debris and dust on your floor. Use the Rubber Brush to clean out the dry mop head. It is versatile. The mop base can be locked into position to wash walls, ceilings or windows. 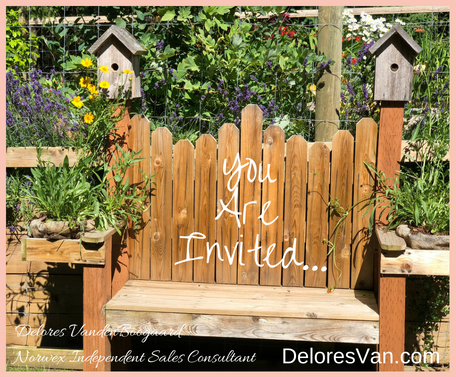 There is lots of FREE product available for my hosts this month! 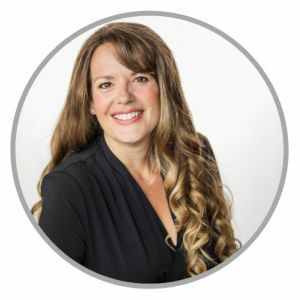 If you fell in love with the product at the party you attended and want more product to try, hosting is a perfect way to do that. I like to call it “Norwexing” your home! Book your Norwex Party today.